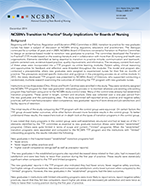 The long-awaited results from NCSBN’s large, national study of transitioning new graduates to nursing practice are now available. This randomized, multisite study was conducted in two phases. Phase I took place in hospitals with RNs, while Phase II was conducted in public health, home health and nursing home settings with RNs and LPNs. 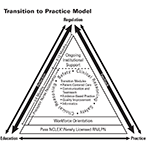 Transition to Practice Study Results Web Page The long-awaited results from NCSBN’s large, national study of transitioning new graduates to nursing practice are now available. This randomized, multisite study was conducted in two phases. Phase I took place in hospitals with RNs, while Phase II was conducted in public health, home health and nursing home settings with RNs and LPNs. Customization so the new graduates learn specialty content in the areas where they are working. Here are the psychometrics for the Preceptor Evaluation Tool utilized in the TTP study. In Phase II we looked at the feasibility of implementing a transition program into non-hospital settings. Those results found that, while transition to practice programs have the potential for improving outcomes in non-hospital settings, we need more evidence on Phase II sites before boards of nursing can require transition programs. That research report will be coming soon. NCSBN has published a summary of the study's implications for boards of nursing. The March 2015 Issue of the Journal of Nursing Education featured an editorial by the study's lead investigator, Nancy Spector, PhD, RN, FAAN, discussing the implications of the study for educators. In the April 2015 Issue of the Journal of Nursing Regulation, the study's investigators published the findings from Phase II of the study. More published reports on our findings will be found here in the coming months.